Download Moto G5 Plus Toolkit to Unlock Bootloader, Root and Install TWRP Custom Recovery etc. 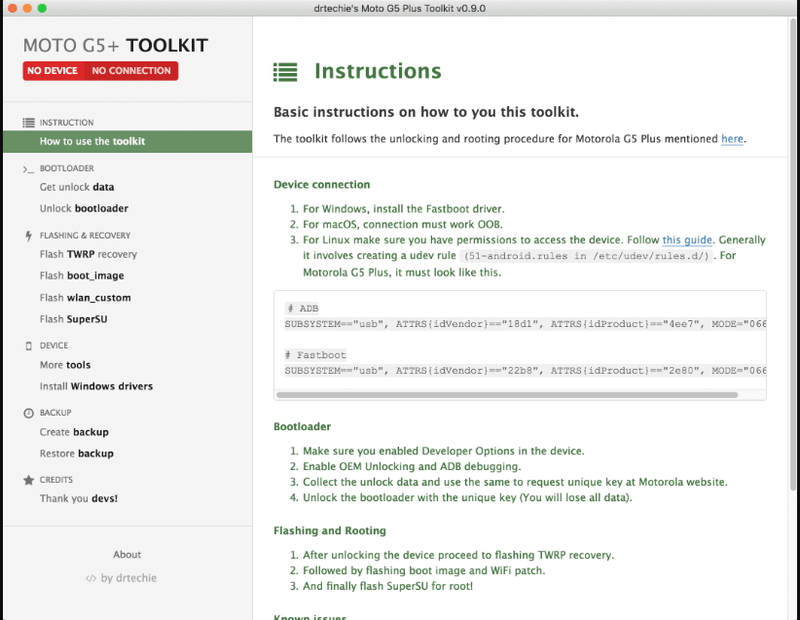 This is a Windows/Linux application which allows you to unlock the bootloader and root a Motorola G5 Plus smartphone with a few button clicks. It's built with Electron and hence will work on Windows, macOS and Linux operating systems. Finally, the Moto G5 Plus has got its own all-in-one toolkit to unlock bootloader, Install TWRP Recovery, Root, Install USB Drivers, Create and Restore backup etc. This all-in-one toolkit will reduce your work to Root Moto G5 Plus and Install TWRP Recovery. It is available for Windows, Mac, and Linux platforms. So, just download the Moto G5 Plus Toolkit for your platform simply follow the link given at the bottom. and start to Root your device. 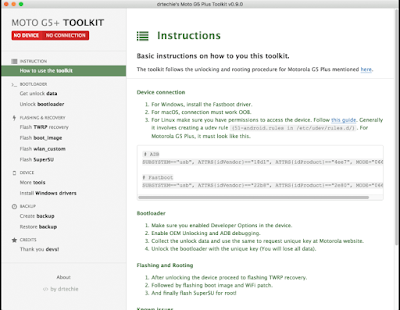 The Moto G5 Plus Toolkit was developed by an XDA member, drtechie. We appreciate his efforts for providing this wonderful toolkit for Moto G5 Plus. Step 1: Download the Moto G5 Plus Toolkit from the above downloads section. Step 2: Extract the zip package to your desktop. Step 3: Open the extracted folder and run “Moto G5+ Toolkit.exe” as administrator. Step 4: The Toolkit should run and provide you with options to unlock bootloader, install TWRP Recovery and Root Moto G5 Plus. If the Moto G5 Plus Toolkit has helped you in accomplishing your task then don’t forget to thank the developer of this tool. Also, don’t forget to share this page with your friends on Facebook, Twitter and Google Plus etc.